Better late than never, right? I posted the first two parts from our Presidents Day Weekend Road Trip during the week right after the trip, but here I am just now getting around to talking about what was the highlight: our stop on the way home from Bend at Cascade Brewing and Raccoon Lodge in Portland for a half day-long visit with Brewmaster Ron Gansberg. For those not familiar, Raccoon Lodge is a restaurant/brewpub that was started in SW Portland in 1998 by Art Larrance, who has been a part of the Oregon craft brewing scene since its inception. He was a co-founder of Portland Brewing in 1985, and he created the Oregon Brewers Festival in 1988, which has grown to become one of the country’s largest beer festivals. Cascade Brewing is the on-site brewery that crafts the house beers for Raccoon Lodge. 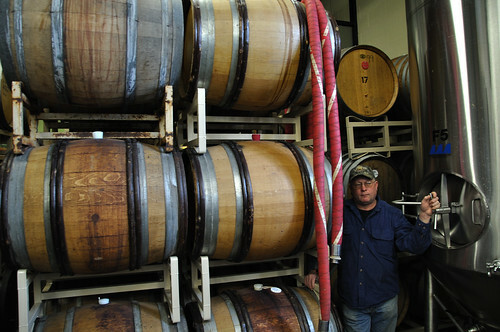 Brewmaster Ron Gansberg started his career in the wine industry, but then he began an eight year stint at BridgePort Brewing in 1986, where he sharpened his brewing skills and helped design and install the 80 bbl brewhouse that is still in operation today. From BridgePort, Ron jumped on board with Art and helped design and install the brewhouse at Raccoon Lodge/Cascade Brewing, and he has been creating special beers there ever since. Over his time there, Ron has had a focus on experimentation and rotating a wide variety of styles in and out of their draft lineup on a constant basis. He really struck upon gold about 5 years ago though, when he started to experiment with sour ales. Ron, along with production brewer Curtis Bain, has continued that experimentation and has really dialed in Cascade’s sour ales over the past three years. They have multiple GABF medals as rewards for their effort, and the spotlight on Cascade currently stretches across the US to the East Coast, where they have started some limited distribution. To be completely honest, this visit is easily one of the high points from my short time of writing about craft beer. I already had a high level of respect for Cascade and the beers that Ron has been putting out, but after this visit they are entrenched as one of my favorite breweries around (same with Jeanne). Ron has been in the beer business for quite a long time, and he’s the type of brewer you wish was at the helm at every brewery. As he talked about certain aspects of the business and certain beers, seeing his excitement and pride (“humble pride” at that) makes him hard not to like. He’s all about making the best beer that he can, and he really enjoys experimentation with new styles and recipes. The soon-to-be-open (possibly May) Cascade Barrel House at 9th & Belmont in Portland is going to be heaven for sour beer drinkers. The tasting room there will offer sixteen taps of sour beer and two taps coming straight out of the wooden barrels. They’ll have Cascade sours, as well as beers from other domestic and foreign producers of sour and wild ales. They will continue brewing all of their beer at the current brewery, and then ship barrels to the new location for storage. They will have room to store around 350 barrels. This place promises to become one of the hottest spots in Portland, and the country, for sour beer. Of all the beers we tasted, one of the most impressive was a new concoction called Noyeaux. 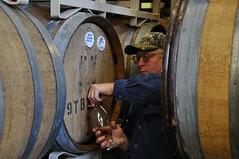 ” We took a lovely strong blonde (109 plato or so) and aged it in white port barrels that we got from California. We took that and we added some raspberries and we aged it on that. Then we added the nuts from inside apricot pits, which are known as Noyeaux. These meats of the apricot pits are highly prized in France and Europe for marzipan. Not sure we’ll ever be able to do this again, because we’re not sure we’ll always have a source for white port barrels.” The nuts added an evident almond taste to mix with a puckering sourness and berry flavors. The aroma was decadent. In Jeanne’s words, “If I could love a beer more than Geoff, this would be it.” As recent as last week, I believe that Cascade had this beer on tap at the brewery; get some if you can! Look for bottles of recent GABF award winning beers Vlad the Imp Aler and Bourbonic Plague this spring. Look quickly though, because they’ll disappear fast. Sadly, the future of Cascade beers in the Seattle market seems to be in a state of flux. You can currently still find bottles in stores, but due to an “unclear distribution situation” Seattle seems to be getting lost in the shuttle for distribution. I’ll keep my fingers crossed that whatever the issues are get resolved, and that we continue to see Cascade sours on our shelves long into the future. I’ve added pictures from the Cascade visit to the rest of the Presidents Day weekend group on Flickr. Our visit to meet Ron and visit Cascade was one of the most important and fun things in my relationship with beer and brewing. Nicely done! and yes…Cascade rules!!!! Ron’s a madman and extremely generous on those barrel tours. I can’t wait until the barrel room opens and hopefully another Cascade Night during SBW.